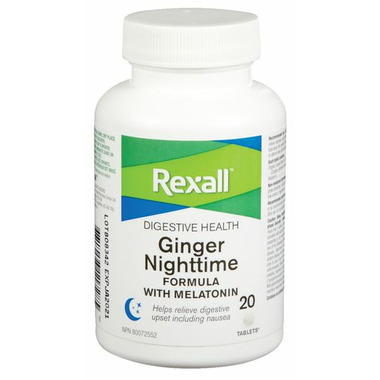 The Rexall Ginger Night Time Formula With Melationin helps relieve digestive upset including nausea. Dosage: Adults: 2 tablets once daily, at or before bedtime only, or as recommended by a physician. Do not drive or use machinery for 5 hours after use. For use beyond 4 weeks, consult a physician.